Thanks to StumbleUpon, you’ve come across this wickedly cool website featuring the latest and greatest music videos or recipes for borscht or something else that’s unusual. Being the good person you are, the first thing you think of is the good of others — in this case, the good of your fellow Stumblers. You want to tell them all about this way-cool site — which in the StumbleUpon world means that you want to “share” the site with them. In a StumbleUpon context, you can only share content with someone you are following and with someone who is following you. Click the Share icon at the top left of the screen. 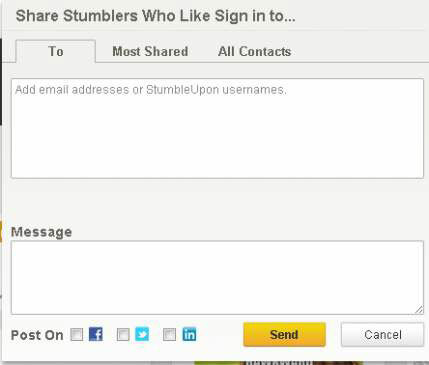 You’ll find a Share icon on the StumbleBar as well. Share the content via e-mail or by their StumbleUpon account name. Share this content with those Stumblers you have shared the most content with in the past (Most Shared). Include a message via the Message Box at the bottom. And share this content via one of three social media networks: Facebook, Twitter, or LinkedIn. Make a choice and let the sharing begin.